I never tasted Orange Chicken in India. After marraige when we went to Dallas, USA , there one of my husband's friend reffered us Panda Express, the famous American Chinese chain restaurant of Texas. There we first tasted their famous Orange Chicken, Kung pao chicken, and many more. The combos are very pocket friendly, so we often used to visit the place mainly for dinner. The taste is not too good, but it is ok and may be $ 15 to 16 for two of us. So we never expected too much. I never tasted Orange Chicken in India. After marraige when we went to Dallas, USA , there one of my husband's friend reffered us Panda Express, the famous American Chinese chain restaurant of Texas. There we first tasted their famous Orange Chicken, Kung pao chicken, and many more. The combos are very pocket friendly, so we often used to visit the place mainly for dinner. Take the boneless chicken in a bowl, and wash under tap water, rinse and pat dry. Now take the pat dried chicken in another bowl, add soya sauce, egg, crushed chili flakes, pepper powder, all purpose flour, cornflour & salt and mix nicely to coat the chicken well. In the meantime take another bowl and add orange juice, soya sauce, white vinegar, brown sugar, honey, orange zest & pinch of salt and whisk them together. We will use it after sometime. Take a pan, heat 1/2 cup sesame oil, if not available then any white oil. Fry the chicken pieces for 3 to 4 minutes or untill golden brown. Take the fried chicken out of the pan and keep onto paper towel to absorb excess oil. Dicard the remaining oil, and heat fresh 1 tablespoon oil. Add chopped garlic, ginger & chili flakes, fry for a while and add the sause mixture which we whisked earlier. Let the sauce mixture boil for few seconds. In the meantime take a small bowl, add 2 tablespoons cornflour, 1/2 cup water and mix well without any lump. When the sauce mixture will start boiling, add the cornflour mixture to thicken the Ornage Sauce. Now add fried chicken pieces in to the sauce and toss to coat the chicken well with the Orange Sauce. 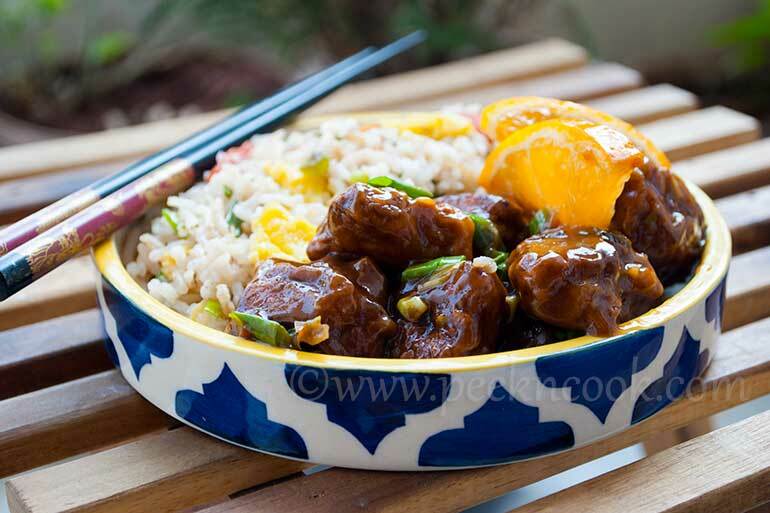 Turn off the heat and serve the Orange Chicken in a oval shaped serving plate, with chopped spring onion on the top. It goes well with Chinese fried rice or noodles.